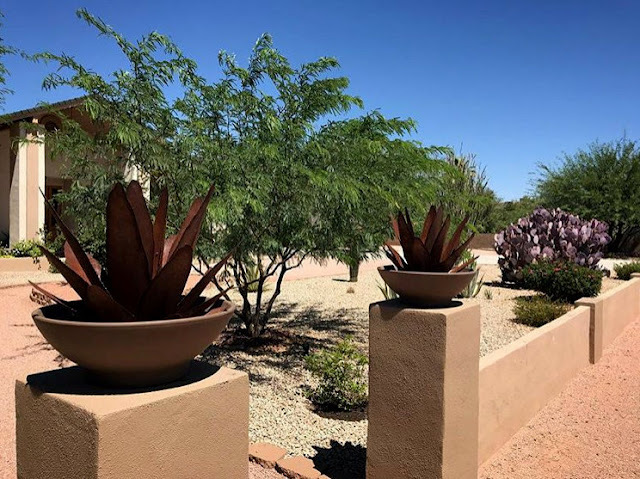 I like his metal Agaves a lot, but I wasn't sure what to expect, after all I am not a fan of gratuitous garden art junk. But once I got to the rusty section I stopped shaking and my eyes relaxed. I don't think I would actually put any of these in my garden, but I liked them. I'd probably have to grow a vine up the metal Ocotillo. This fellow was horribly cute. The horses and stagecoach were a little much, but the pumpkin/cactus was nice. There's my nephew, camped out in the shade, playing a video game. I soon joined him. What a colorful place! I would have been tempted to buy the dangerous spinning suns and the dancing, flute-playing Kokopelli figures. I love rusty stuff in other gardens, for some reason I go for lots of color in my own, like the Talavera. It's good to know what you like and obviously you must be in good company if this guy stocks that much color. I'm not much of a fan of garden art, either, but I do like that rusty owl. Probably wouldn't put it in my garden, though. I like the metal ocotillo, too. I would, of course, want a vine with red flowers growing up it. Oh yes, red flowers of course! I would be in heaven soaking these beautiful objects in .. so colorful and eye catching in shape and form. I think I would have so many of these wonders the plants might just be over looked ! What a gorgeous place to visit, thanks ! Perhaps you need to plan a road trip to make a few purchases? It's funny out these devide opinion. I often find they look great until I get them home and then in my garden they look stupid. Hopefully you hadn't spent too much $$$ before you made that discovery? Love the rusty pumpkin. The painted stuff is too tacky. Beauty is definitely in the eye of the beholder. It is a little overwhelming. Everything in moderation! The rusty metal Ocotillos were my favorites, although I'm also a sucker for Talavera-style pots (in moderation of course). Overwhelming indeed. I would find it difficult to make a selection with so much visual noise. I love gratuitous garden junk. Of course, my garden is one whirligig short of a traveling circus. :) Not a fan of most of the painted metal but the rusty saguaros were fabulous! I especially liked the one in the front that seemed to be dancing. Didja bring home an agave? The owl and pumpkin/cactus were sweet. OK, the pumpkin and the aloes and the opuntia...YES. The rest? Hmmm....perhaps we shall pass this time. But cool to see, thanks! It's a fun place to visit; sometimes it take while to find the rose among thorns. For me there needs to be a overarching "theme" to the garden art, especially if it's all visible. A larger garden, with more hidden nooks, can get away with more varied styles. I’ve been so excited to see your posts of the Casa Grande ruins and my home town, Florence! Hubby and I eat at that restaurant regularly, and the Arboretum is one of my favorite places. They have great spring and fall plant sales. And the garden junk shop, it’s great for those places in the yard where nothing will grow. Thank you for putting our humble little town on the map! That restaurant was so good! How lucky you are to be close to the Arboretum. I would have loved to explore every inch, we spent several hours there but there was still so much I didn't see. I did buy a small Gymnocalycium baldianum, I bet their plan sales are fabulous. Thank you for commenting! Looks like a setting for the next Marvel Comics extravaganza. I'll stop there tomorrow. Can't wait to peruse all the weird, quirky, and (GASP!) whimsical items on offer. The Mangaves, where are they now? Wednesday Vignette, well, that's weird!